The festivals of Midsummer’s Eve, known as Saint John’s Eve among Christians, have roots in ancient celebrations related to the summer solstice. Bonfires were lit to protect against evil spirits which were believed to roam freely when the sun was turning southward again. The Bonfires of Saint John’s (Hogueras de San Juan) is a traditional and popular festival, customary for many cities in Spain. The greatest bonfires though are those of Alicante. For this occasion AEGEE-Alicante has organised an event this year. 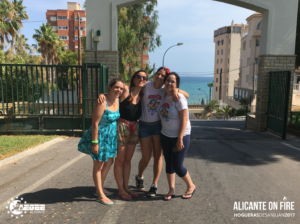 We have talked with the instigators and local organisers of “Alicante on Fire” Elena Agulló, Melissa Carreres and Verónica Pérez. Here is what we have learned of this magical event. 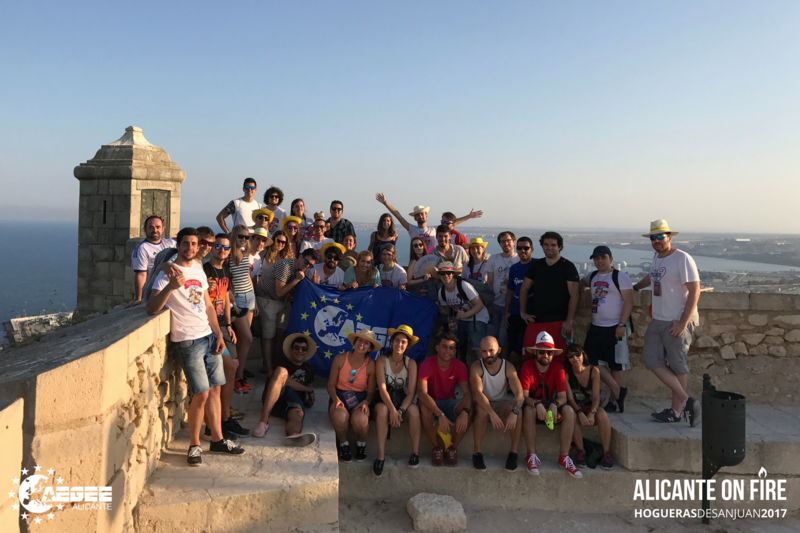 “Alicant on Fire” was held from the 22th until the 25th of June in the coast city of Alicante and 35 participants were part of the group. They were coming from 18 different antennae, mostly Spanish, and they gathered together to celebrate the Hogueras and get to know the local traditions. This was the main aim of the organisers who were a total of eight people. The surprising thing is that inside the group of organisers, just three people were born in Alicante. 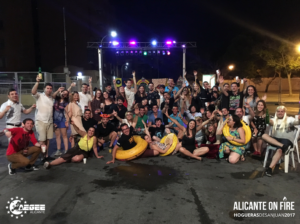 “The rest of us didn’t have so many idea of Hogueras, but we all could say that we learned and enjoyed a lot these festivities as though we have been doing this for all our life!” says Melissa. And it was indeed an amazing job if you consider the fact that their motivation started flourishing during the Mini European School for SelfDevelopment which was organised by AEGEE-Oviedo. The local organisers of Hogueras came back with this willingness to deal with the lack of members available in that period -usually due to exams at university- and create something to develop their antenna and show their magic city during this time of the year. And they achieved their goal managing to engage their members and make the participants get the most out of it. The programme though did not only include activities related to Hogueras. The participants had the chance to practise and learn new skills through various other activities, such for an example a very relaxing yoga workshop on the beach. 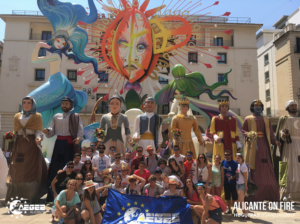 Of course, as every AEGEE event that focuses on the local history and tradition of the place where an antenna is located, “Alicante on Fire” managed to have an impact on the community of Alicante as well. Firstly, the organisers supported the local festivities by having them known in a wider range and by giving a refreshing touch through all these young participants that were in the city for the event. But this wasn’t a one-way relationship, as the organisers enjoyed a very fruitful collaboration with the local authorities. 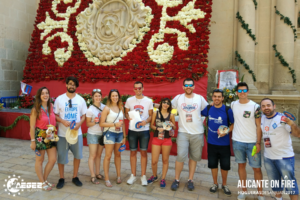 They had support from the University of Alicante, Diputación of Alicante and Alicante Municipal Tourist Board, that have all helped this event to reach another level of quality. In conclusion I would like to leave you with the hidden promise that Melissa left us in the interview. “We are proud of all the hard work that was done and very happy to see that everybody has enjoyed a lot the event. Maybe next year we will have a second edition.. Would you apply?” We, definitely yes!! !